Websites For Those Who Are Short on Time! “My biggest fear about hiring Studio of Dance .com was the amount of time that would be required of me to be able to communicate what I wanted. To my pleasant surprise - it wasn't bad at all! My favorite part was their ability to discern the look I was wanting without me having to take the time to search and research other websites. If you're a business owner, you simply don't have that kind of time. I sent an email with just about three sentences of my preferences! They were really creative, intuitive and knowledgable about what is 'hot' right now. "I would recommend Stacey and her team because it feels as though they were genuinely there for me. Not for my business nor my money but going above and beyond just a website set up. Encouragement, checking in, suggestions, I almost I feel as though I couldn’t start my studio without their help. Can’t thank her team enough for everything. 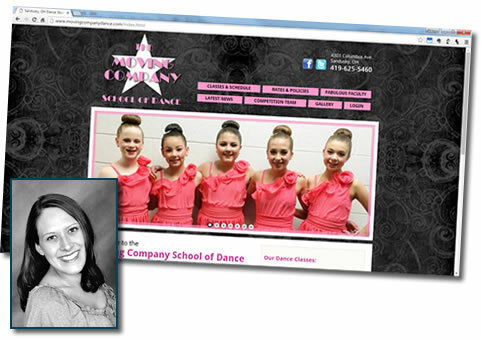 Will certainly be continuing a long relationship with Studio of Dance .com." "I was reopening my studio after 10 years on hiatus! I didn't know where to start or what to do first with my website. When we spoke to all the contenders, Studio of Dance was the one who responded the quickest and the best! Answered all our questions and never made us feel like a number. Studio of Dance was professional but yet treated us like we were old friends and our satisfaction really mattered to them! Wow we highly recommend Studio of Dance to anyone out there looking. When we had a problem with the website getting too much traffic and were worried it wasn't up to par for the traffic, they responded in the middle of the night to help us find a solution! We are so super happy we want you to know about them too! Thank you Studio of Dance it is a pleasure and an honor working with people who do business the way we do!" "I am so excited! I love our website! My design experience was wonderful. Kristen has been AWESOME. So thankful for the Studio of Dance team. You guys are ROCKSTARS!" "Thank you so much for always being so fast and doing such great work. I have really found a wonderful business to create and refresh my site. As always, you did terrific work! We celebrated 10 years last recital and I’m so excited about that. I’m always getting compliments on my website and so much of my success is due to your fabulous design :-) "
I just wanted to share with you how pleased I am with my website! 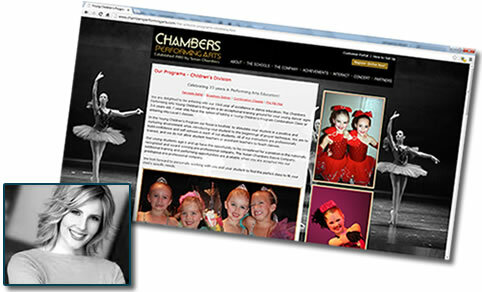 I do quite a bit of dance studio website stalking......;) and I always feel that mine is above and beyond in so many ways! New parents too, always comment on how nice it is! Thank you for designing such a great tool for my clients to use!" “Well, now you’ve done it! I’ve been FLOODED with registration and emails and I think it’s all thanks to you and our fantastic new site. The mobile site is more impressive than I even dreamed and I feel so “COOL”! ...I’ve had MANY compliments on it today (plus almost 900 views coming from FB)! 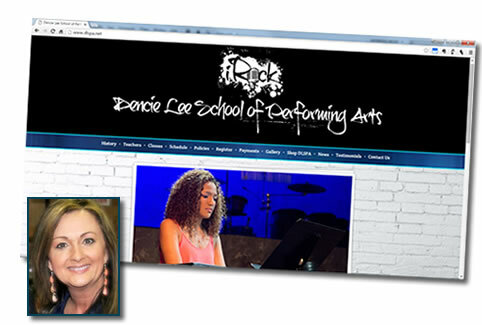 "I love my new site and so do the parents at my studio. I'm sure it will impact business as I go on. Thanks for all your help! It's very much appreciated!" "THANK YOU!!!! We are thrilled with the website - it's fresh, original and appealing. Kristen was wonderful to work with! Every and anything we've needed was 100% accommodated. So impressed with the entire experience!" "This really has been a great process. We're LOVING the new site, and have gotten nothing but great feedback from our parents and students - thanks so much! Thanks for setting up mobile site, that's so great since almost half of our website traffic is mobile." Website Designers Who Care About You & Your Studio! “I had been looking for a while to find a new web designer. Many came and offered services. Then there was the freelancers. Then the opportunity of "designing my own website". But then I came across Studio of Dance. It became clear that they knew what they were doing, and nobody rivaled their portfolio. I reached out and the Director (Mrs Marolf) contacted me back. I knew I hit it right when she started to move right away. Responsive. Attentive. Alert. Knowing the business. And pleasant and respectful in each interaction. Bingo. Got the designer I was hoping for! My favorite part was being listened to. I loved the openness and interest they demonstrated in getting to know my studio. How I do things. Who we are. What we do. They really listened. That is priceless! 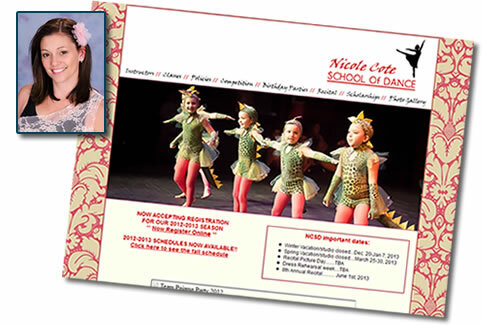 “I really liked the idea that you have been around the dance studio world. I knew you would know exactly what I needed and wanted. I feel I can trust you and that’s a WONDERFUL feeling when you are a studio/business owner. "Just want to thank you all again for the wonderful website. I have been receiving so so many compliments! Everyone that has contacted me about the site absolutely loves the design and layout. I hope that you can come out to the east coast soon! Would love to have you see the studio one day since you and your staff played such a large part of making my vision come true." "Woo Hoo! I am so excited!!!! Kristen was beyond amazing!!!! Seriously she was fantastic and I am sure I drove her crazy at times, but she never let that show...lol! Thank you so much for everything!!! I have had the worst experiences in my past with websites, and I will tell you this experience has been truly AMAZING!!!! You have a gem of a business there!!!" "The artistry we create in our studio, you have brought to life within our website. Your professionalism and willingness to custom develop our message is invaluable. I would like to thank you and your staff for all your efforts! P.S. I'm excited to report to you that in just 3 weeks we've had over 3,000 page loads from 1200 different people..."
Websites that are Simple to Maintain! “I have been working on updating the website and I have to say it is so easy! "Your attitude, responsiveness, and exceptional customer service are like a breath of fresh air in an increasingly incompetent and frustrating world. Your products and approach to the task are well presented and well executed. An overall outstanding experience and value." "I LOVE the new website! You and your staff have done a wonderful job!!! It look so "today" and makes me feel good about the future of the dance studio." "Our website needed to be updated, and we also wanted to be able to edit information ourselves. We are so very pleased and excited with the results. Stacey and Craig are very easy to work with, understanding all of our needs. 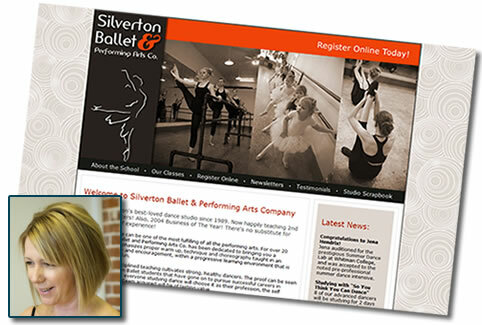 Their vision and expertise designing the new site have been greatly appreciated." "I have received so many compliments on the site! Some people have told me that they have chosen our studio because of the website! :) Move closer to New York so you can come dance with us!!" "So a guy saying he was from GOOGLE called me last week. I accepted the call just to see what it was about. They were trying to sell me a package that would help my SEO. Well, I told them I was pretty sure I was already at the top and didn’t think I needed any help. Of course he didn’t believe me initially and so he tried to keep me on the phone for a bit longer. Guess what? After a few seconds he said “Wow, you’re right. I just did a search for your business and you are already on top. We can’t sell you anything to help you because your business is already coming up first in google listings”. 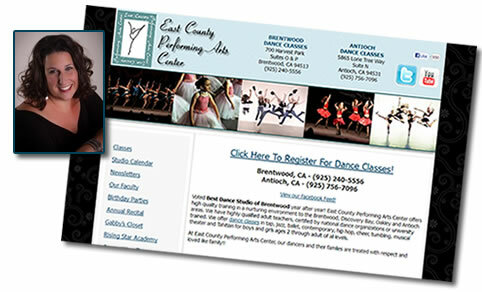 Thanks to the help of studioofdance.com I am on the cutting edge in my area! Thank you for not only getting me here but helping me stay here! At the top!" "I wanted to say thank you for being a creative and encouraging "partner" in my business. 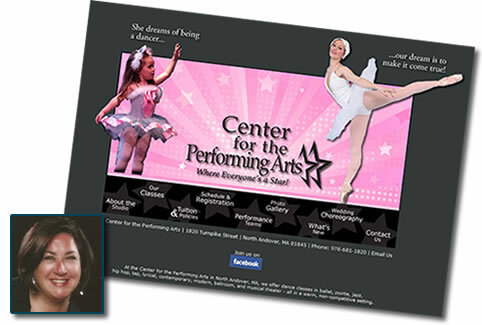 Contempo's internet presence gave the greatest return of all of the studio marketing I did, and the professionalism of your work represented my studio wonderfully in a very competitive market. One of my friends who does marketing consulting said that the website that you created for me did a fantastic job of differentiating my studio, and I believe that it brought me the type of student that fit well with my mission. I ultimately decided to close the studio to pursue a better work-life balance, but Contempo could not have achieved the level of success that it had without your help." “My favorite part of the design experience was my collaboration with my website designer. She responded with suggestions and solutions to any of my concerns and requests. We worked well together to create a gorgeous new website design that we both love! "I LOVE LOVE LOVE the new site. It is AMAZING, more than I even thought it would be and design wise was exactly what I was looking for. It will be so easy for the parents to find everything and for me to say "it's on the website" YAYAYAY!!" "I want to tell you how much I enjoy working with you. You are so fast in all your replies and quick updates. We have received countless compliments to the website. The speedy postings of newsletters has dramatically increased communication with the students and parents. Especially during the rehearsal time when folks kept losing their paper schedules, they had it handy on the site. The presentation of the site has done volumes for pre-selling classes. Please don’t hesitate to use me as a reference." "We are very pleased and excited about our new website! Kristen has been such a pleasure to work with! Websites Worthy of Your Studio! "Thank you so much for all your hard work on the Riverside site! You are so good at what you do and we appreciate the artistry you bring to your work! 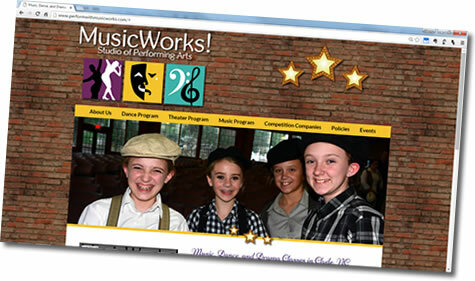 The website looks great and we are all very excited about it!!" "Our parents are LOVING the website! We have gotten a lot of compliments and positive feedback. Thanks for the lovely/hard work!!" "You and Craig did great with the sporadic information I was sending you! The website makes me very happy and I know will help out in so many ways! Thanks for your patience and understanding through this process, you will never know how much it was/is appreciated!" "I can't tell you enough how much I love my new website. I am getting such great feedback from all the parents and new students too." "Thanks for making it soooo easy – I love the professionalism and creativeness of the website – a million times better than what I had! And I'm very happy I am able to update it!" "I thought you guys were wonderful! I loved that I was given updates. You were very quick to put the website together and really understood what I was looking for."